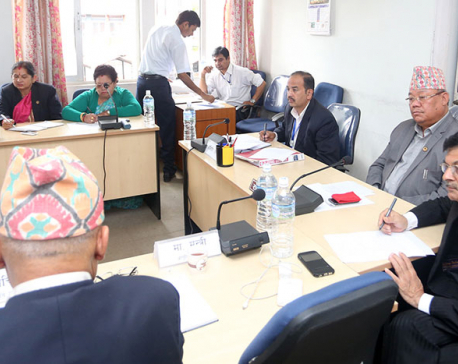 KATHMANDU, Feb 3: The Development Committee of parliament has directed the authorities concerned to immediately blacktop road stretches that have been dug up by the Melamchi Water Supply Project for installation of water pipes in various places of the Kathmandu Valley. Stating that the dug up road stretches have caused heavy air pollution in the valley, committee chairman Rabindra Adhikari asked officials of the Kathmandu Valley Development Authority, Department of Roads, Kathmandu Metropolitan City office, Lalitpur Sub-metropolitan City office and the Melamchi Water Supply Project to work jointly and blacktop the road stretches as soon as possible. The committee has asked them to come up with a clear time-bound action plan to complete the tasks as soon as possible. Following discussions with the officials, the committee concluded that there lacked proper coordination among the concerned officials on repairing the road stretches that have been or are being dug up for laying the pipes. Director General of the Department of Road Devendra Karki said that the department has not been able to begin blacktopping of the roads as the Project Implementation Directorate of the Melamchi project has yet to complete pipe installation works. He said that the blacktopping of some of the road stretches will begin from next week as the directorate has said it is going to complete the tasks on some road stretches by then. "The contractor and raw materials are ready. As soon as the directorate informs us about the completion of their work, we will start blacktopping the roads," he said. Tiresh Prasad Khatri, Project Director of the Project Implementation Directorate of Melamchi Sub-Project 2 said that the directorate is going to hand over some road stretches to the department for blacktopping from next week. Currently, the task of installing water pipes is being carried out in over 40 road stretches in Kathmandu and Lalitpur districts. DoR officials said that the blacktopping of all the road stretches will be completed within a month of the start of the work. Lawmakers in the meeting said that the authorities concerned should not allow vehicles on the dug up sections as this has caused air pollution and walking on the street difficult. "Vehicles are running along the dug up roads throwing up dusts. So, the road department should close the roads for vehicles until they are blacktopped. This can really help control dust pollution," lawmaker Prem Bahadur Ale said. Secretary of the Ministry of Drinking Water and Sanitation Bhim Upadhyaya said that the Kathmandu Valley may witness shortage of drinking water in the soon if the government does not release necessary budget for repairing the pipelines damaged by the DoR during road expansion in the past. He said that the ministry needs at least Rs 310 million for repairing the pipelines. He said that around 55 percent of the pipelines have been damaged during road expansion. He said that the DoR and other local bodies caused damage to the pipelines on various occasions in the past. "If the pipelines are repaired on time, there will be water shortage even if the Melamchi water starts flowing into the Valley," he warned.